Immigration is a rich, complex topic that is front and center in public debates. If you combed through the Pew Research Center archives, you’d find that we have published hundreds of reports and blog posts about immigration in recent years. Want to know more about immigration to the U.S.? Take your understanding to the next level with our short email mini-course. Perhaps you would like to have a better understanding of immigration, or maybe you would like to know what the latest research has found. The question is: Where do you begin? You probably don’t have time to read thousands of pages of our research, and our latest publications focus on what’s new, not necessarily the big picture. If what you’re really looking for is a shortcut study guide to what Pew Research Center knows about immigration, we have good news! Our researchers have distilled much of what we know about immigration into a five-part email mini-course. You’ll receive an email every few days over the span of a couple of weeks. As with all of our work, it’s free. 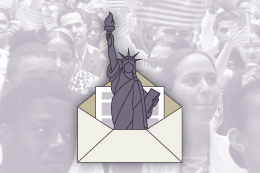 Each email will answer a different question about immigration: Who are U.S. immigrants? How has immigration changed the U.S. – and how will it do so in the future? Who are legal immigrants and who are unauthorized ones? And more. You don’t need an advanced degree or hours of free time to understand the historical context and current complexities of immigration. As experts who study this topic every day, we think it’s our duty to make it easy (and maybe even a little fun) for you to learn about it, too. You can sign up here to take the course. Happy reading! And please tell us what you think. Mark Hugo Lopez is director of global migration and demography research at Pew Research Center. If they could, how many unauthorized immigrants would become U.S. citizens?